According to the UK tabloid, THE SUN, A British couple yesterday became Africa’s first white chief and queen. 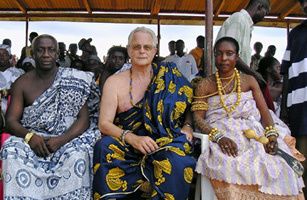 John Lawler — already chief of the village of Shia, Ghana — saw his new wife Elaine made queen in front of thousands of well-wishers. The ceremony was just 24 hours after their marriage was blessed in front of chiefs and elders from across Ghana. John, 31, was made chief Torbui Mottey I eight years ago after helping set up a secondary school during a gap year. The village’s main chief decided to bestow the title on Elaine, 33, after travelling to Newcastle to meet her. Elaine, of Gateshead, Tyne and Wear, will be now known as Mama Amenyo Nyowu Sika. Jimmy Moxon is one of the few white chiefs in Africa recognized by a government. On September 13, 1963, Ghana’s official newspaper announced the investiture of Nana Kofi Obonya (literally, “the chief born on Friday, who lives at the bottom of the cliff”). Jimmy Moxon was twenty years old and just out of Cambridge University when World War II broke out. He became an administrative colonel on the Gold Coast. In 1957, when Ghana became the first African country to achieve independence, he was reluctant to leave. The king of Aburi offered to make him a noble. The “white nana” carries out his functions seriously and respectfully; he settles disputes, sits on the royal council, and coaches a soccer team. People must bow to him. He is the only white person in Africa who is borne on a processional litter. It has become a trend among some African kings in Ghana and Nigeria to have a “white chief,” who is not involved in quarrels among Africans . The investiture ceremony costs between twenty-five hundred and seventy-five hundred dollars. We have found about twenty “white chiefs,” most of whom reside in Nigeria, including a French cultural attache and a number of businessmen who take advantage of opportunities offered by traditional chieftaincy to boost their profits. Munich, West Germany – King Fritz from Herne lives in Duesseldorf and has ruled over 300,000 subjects of the Ashanti peoples for the past eleven years. The Ghanaian people selected the German to head the throne and he admires the throne which is a distance of 6000 kilometers from where he lives in Germany. The 75-years old Fritz Pawelzik leads an interesting double life. In domestic Duesseldorf, the former miner, enjoys his Pensioner existence – and 6000 kilometers away he governs as a white master king over the Asantes of Konogo. Cheer up comrades, things are getting worse! You know, because of their history of monarchies in Europe they transfer the meaning of the title, Chief of Development to mean something else. But I seriously doubt if they know what the true meaning is. On the other hand, if the Ghanaians decide to bestow a stool upon this gentleman, then for all intents and purposes, he did not steal it. He paid for it, pure and simple, and that is the only stole anyone can pay for, i.e., the many folks of a darker hue who have done the exact same thing. They pontificate and fail to let the masses know the tradition surrounding being a Ghanaian Chief. Also, they too may not have been told what the meaning of it is. In fact, Chieftancy in Ghana according to my knowledge is about how much land you “own, cultivate, etc., how many folks you take care of and all that.” They made Michael Jackson and Isaac Hayes Chiefs. This title is based on contribution to the community's development. They may have built schools, no matter the size, or non-profit organizations to help. So, all I am saying is, it's like the person who beats up the person who cheated with your partner. Instead, look at the partner, they could have said no, at any time!!! If the Ghanaians don't have any problem bestowing this title on a man of European descent, what can we say about it?? Certainly being negative is disingenuous, cause I don't know about you, but I got white Ancestors!!! Also, fyi, anyone can get an Akan name, you don't have to be Akan or born their. And Nana is a title that is given to certain folks, so many folks it ain't funny, to be honest with you.. But it is the Appropriate title for a Chief of “Whatever” he/she may be. Out of respect, you call them Nana.That's just how Ghanaians do things. So you might wanna take your gripe to the high courts in Ghana. Ha!! they got Queen Elizabeth on their money. Folks we need to take off the veil and do some serious studying!